SAN ANTONIO, TX--(Marketwire - October 8, 2010) - The relaxing, yet invigorating atmosphere of San Antonio's beautiful River Walk makes it a perfect destination any time of year offering magnificent River Walk hotels, exceptional shopping opportunities and fabulous options for delicious San Antonio dining. Downtown restaurants are plentiful and Mexican flavors abound, but one River Walk restaurant takes its Latin menu beyond authentic to offer guests a truly unique dining experience and a lunch special that is unrivaled. When dining on the River Walk at Sazo's Latin Grill inside the San Antonio Marriott Rivercenter guests will experience all the sizzle of Mexico served up with the finest ingredients and genuine quality meats to bring the restaurant's lunch special, a Taqueria Buffet, to life with exciting flavors and all-you-can-eat service. Lunch guests will enjoy freshly-prepared chicken, fish, steak and tacos al pastor made to order by master chefs and served from the restaurant's open kitchen with sidekicks of juicy tomatoes, spicy chilies, onions, cilantro and a variety of restaurant specialty salsas, ensaladas, queso, creamy guacamole and more. Adding to Sazo's "more than authentic" tastes and perfect for cooling the warm Mexican fare are an assortment of refreshing Agua Frescas of the day or an icy Margarita of choice from the restaurant's popular Margarita bar. Guests are invited to experience this spectacular lunch special from 11:30 a.m. to 2 p.m. Monday through Friday from Sazo's second floor location inside the sophisticated San Antonio Marriott Rivercenter where the deep hues of an Argentine sunrise are reflected in the restaurant's décor to provide a warm and invigorating ambiance true to the River Walk atmosphere. 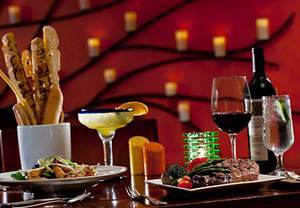 In addition to this spectacular weekday lunch, the restaurant is open daily for breakfast, lunch and dinner and offers fine wines from the Central Texas region along with its bold menu of Latin and Spanish fusion cuisine. The San Antonio Marriott Rivercenter hotel stands distinctly along the beautiful San Antonio Riverwalk and among hotels near AT&T Center providing guests with an offering of over 900 well-appointed guest rooms and 82 opulent hotel suites. Conveniently located near popular San Antonio Riverwalk attractions including cultural and historical landmarks, the adjacent Rivercenter Mall and the San Antonio Henry B. Gonzalez Convention Center, the Marriott Rivercenter is an easy choice whether visiting San Antonio for business or pleasure. A stunning architectural presence against the San Antonio skyline, the San Antonio Marriott Rivercenter stands proudly above the legendary River Walk.